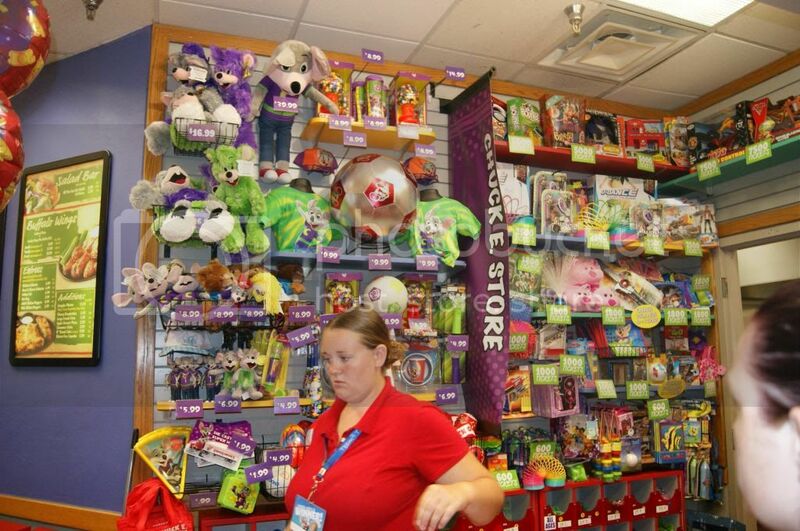 Andrea's World Reviews: Chuck E. Cheese Celebration! If you have been reading my last few posts, then you already know that my wonderful son just turned 6 years old. You would also know that this was no ordinary birthday. My son is extra special, because of his autism and because of his awesome personality. The autism though, affects his social skills. In the past, it caused him to become very upset during happy moments. If he got too excited, he would end up being overstimulated and getting very stressed to he point of crying. I hate to see my little man even slightly upset, so needless to say, this was a very hard thing for me. I always wanted to celebrate and do fun things for him, but I was worried that I could make him feel worse trying to make him happy than if I had done nothing. It is a terrible predicament. Thankfully, he is making incredible progress every single day. I am perpetually amazed by all of his accomplishments, and I am so proud of how far he has come already. When he was first diagnosed, he did not speak a word. Now he can say read, spell, write and type almost anything. The only place his words are lacking is in spontaneous conversation(small talk, chit chat, in depth conversation). He is a computer and math wiz, and can do just about anything he tries to do. His social and coping skills have increased exponentially. He has made such outstanding progress, that I wanted to do something extra special to show how proud we all are of him, and to show him that he is becoming a "big boy". I decided he should finally be ready for a real party(he has never had one because of his predisposition to over-stimulation). Since he has missed out on 5 years of birthday parties, I wanted to make his first official party epic. Nothing too intense of course, but as fun-filled as possible. I decided one day was not enough, so we hit a couple theme parks before his birthday, spent the day of his birthday at home for a quite day(like every year prior) with cake and presents, and decided the day after his birthday would be his birthday blowout. We had stage on of the party at Build-A-Bear workshop. I knew we would be hungry after that, so instead of doing something at home, or going to a boring old restaurant, I decided to make the second part of the party unforgettable, by having it be food, fun, games, and gifts all in one. There is only one place I could think of that could fill such a tall order. Chuck E. Cheese stands alone as the ultimate celebration place. I remember going there when I was a kid, and it was always my favorite place to be. I loved the food, the rides, the games, and the prizes. Even the atmosphere was awesome, tons of kids all there to have fun, it was awesome. I knew that my son would love it(I just hoped not so much that it upset him). I had not been to a Chuck E. Cheese for about 20 years, so I had no idea exactly what to expect now, but I knew it would be great(which is why it lasted over 20 years). It was even more awesome than I remembered. There is so much to do. There is something for everyone and then some. There are ride-ons for small kids, my son even ride one. And some easy games that are low to the ground for kids(like a ball pop one, that my son LOVED, even my 20 month old could "play" it). There was a small basketball shooting game that son did very well on. My daughter enjoyed handing him the balls as they came out each time. There is ski-ball, which has always been one of my favorites. My son had a little trouble tossing the ball hard enough without hitting the glass, and I was so busy with the kids that I could not play it either, but hubby did a couple games. 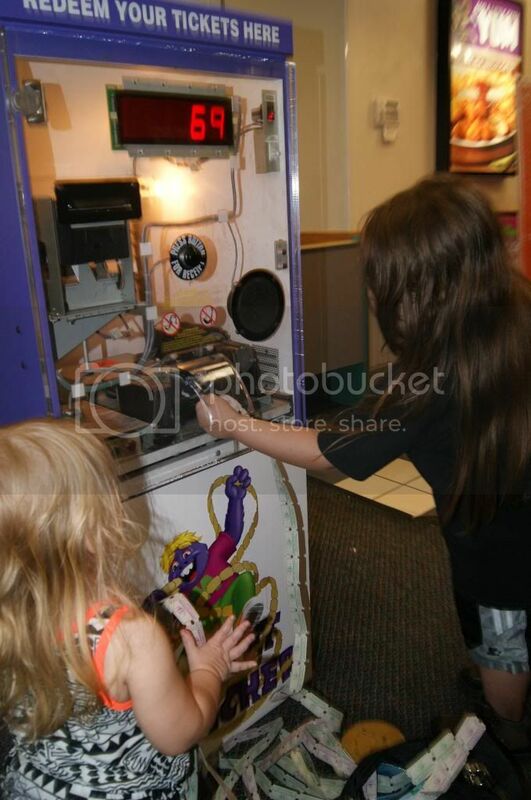 There are arcade type games, which were awesome for my sister and some for the other teenage guests. The single game that I think was played the most was the token push game where you insert a token that gets flung into the pile of tokens that has little pushers constantly pushing. The objective is to push the tokens over the edge. It is totally addictive. My son and I loved it, and my daughter loved pulling off all the tickets ans they came flooding out(we earned a lot of tickets on that game) That was my daughter's favorite thing of the day I think, besides the food. I love that all the games are only 1 token each so you don't go broke buying tokens. Tokens cost only 25 cent each(or even less when buying them in bundles). 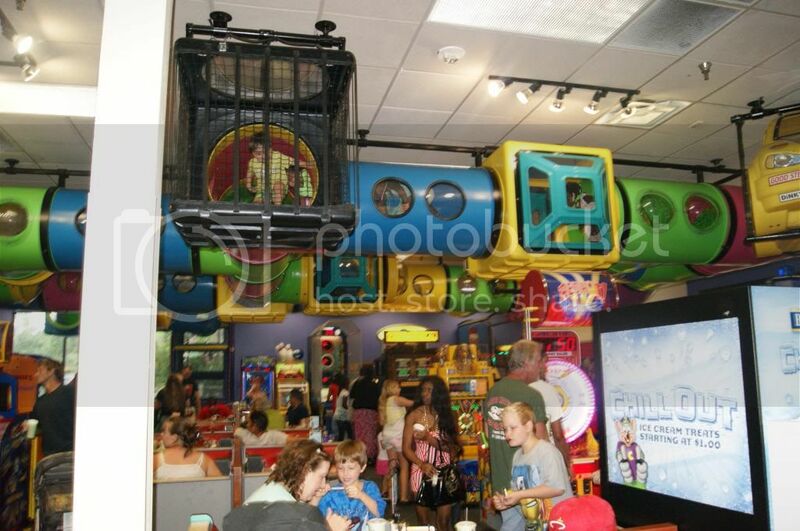 There is even a slide and tunnel area for the kids, which does not even require tokens, so if they run out, they do not have to sit like a bump on a log, they can still have a blast. As much as there is to do, you would thin it is only about the awesome games, but you cannot forget about the incredible food. After you order, you just place your number on the little holder on your table, and the food it brought right to you. It is so fast. Way faster than I imagined, especially with how many people were there. The food was hot and super fresh. The quality was fantastic. We got 4 kinds of pizza, Cheesy Bread and a chicken nuggets meal(for the birthday boy), and it was all there in about 10-15 minutes. Everything tasted wonderful, all the guests though so, especially my daughter who ate a lot. Naturally, the kids wanted to be up with the games so much I only got a few bites while we were there. I tore into the leftovers on the way home though, and even cold it was amazing). The atmosphere was crazy fun. The place was packed. There was another birthday party(a 6 year old girl), and like every table was filled. Even with all the people, neither of my kiddos got upset. That is like a miracle, because of my son's prior reactions in that kind of commotion, and my daughter's fear of strangers(even distant family, but adults mostly) and noise. I guess their excitement overcame the potentially frightening aspects. The only "problem" I experienced having so many people is that I was having a hard time trying to keep up with both kiddos, and I was afraid of losing one, which made it like impossible to lug around my DSLR camera and get all the pics I wanted to take. Thankfully, I did not end up losing anyone(but I did miss out on getting any pictures of them playing games). What is awesome though, is that even had I "lost" one of the kids, I would not have to worry that they got outside without me(alone or taken) because of the awesome Kid Check program the Chuck E. Cheese has. Upon arriving, every family(or group, etc) is given an invisible stamp with a specific number, and when it's time to leave, the numbers are verified with a special light to make sure they match. No kid can get out alone, and no adult can take a child whose number does not match. It is such a great system. It really takes a lot of burden off your mind, and I wish more places had something like this. When it was time to go, we paced out leftovers in the to-go containers that are conveniently available near the garbage cans s you do not have to ask or wait for them. 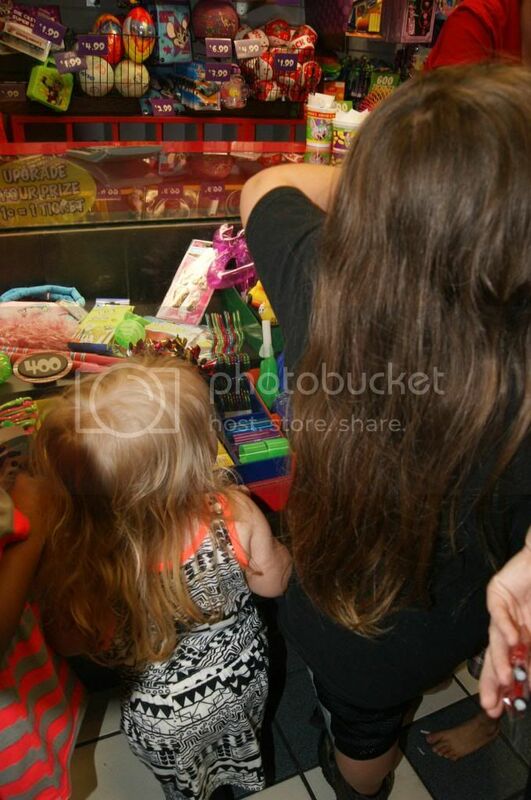 As if the games, rides, play area, food, and fun were not fabulous enough, you also get to cash in all the tickets you earn for awesome prizes. 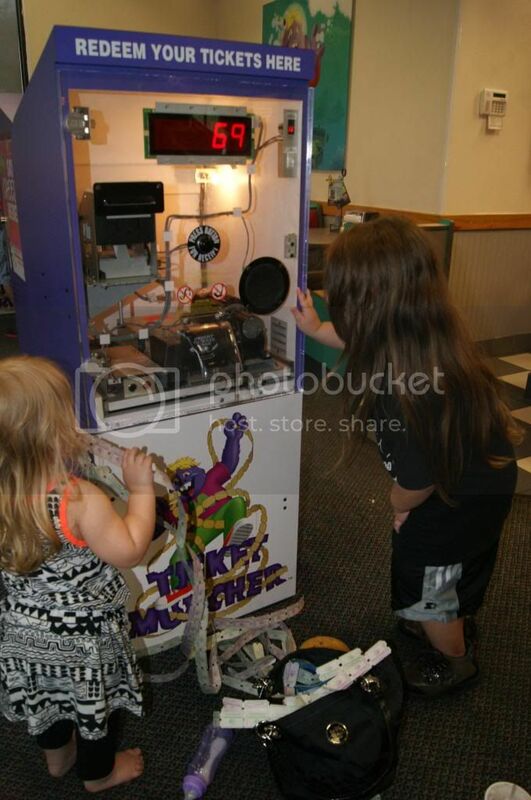 We took our tickets to the ticket muncher for them to be counted. 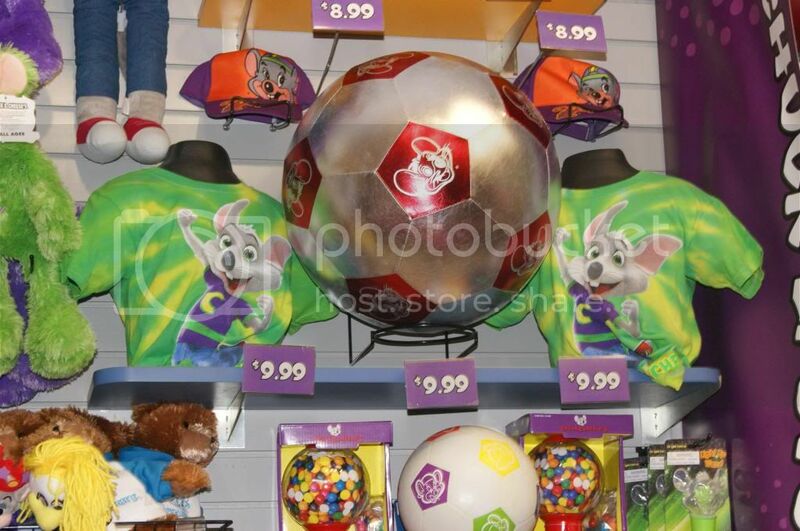 Both kids loved this just as much as the games. They got so excited seeing the tickets get munched up, and my son loved watching the number on the counter get higher. 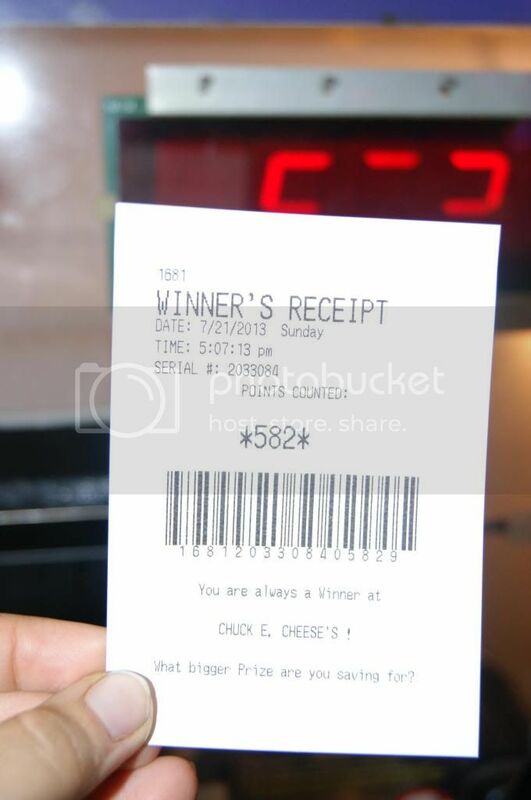 After filling up on tickets, the machine gives you a receipt to redeem for your prizes. There are so many cool things to pick from. What is really cool is that if you don't have enough tickets for what you want, you can pay to upgrade your prize. 1 ticket equals 1 cent toward the prize(and vice verse). So the prize my son wanted was $9.99 and with some bonus tickets we got, we had about 750, so I paid the $2 and change balance and he was able to get the awesome ball he wanted. He loves his prize, and as much as he would have liked it no matter how he got it, the fact that he earned the tickets to get it made him so proud that it is even more special to him than had he got it another way. We all had so much fun. We will need to make this a more regular thing(It's kind of a long drive, but it's so worth it). I know it is going to be expected(and happily obliged) every single birthday from now on, but I think we need to go more often than that. This was a magical and unforgettable day. I know it will be a fond memory for my kids that should last into adulthood(as my childhood Chuck E. Cheese memories have). 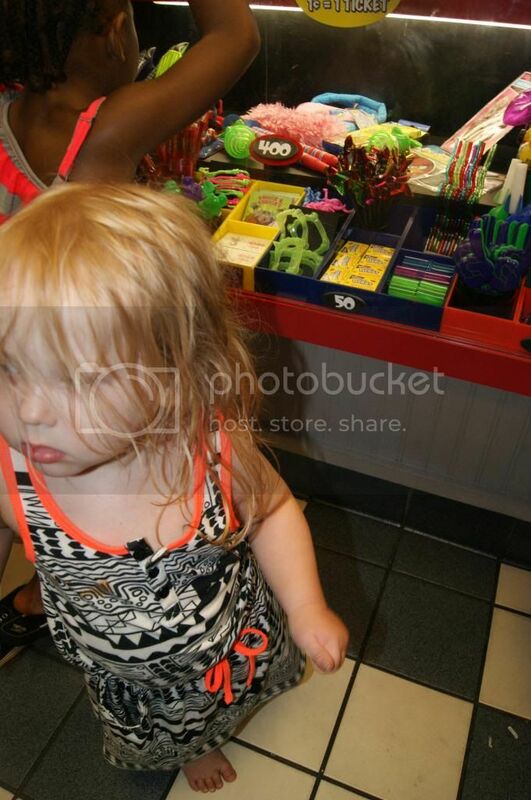 And this is only the first of many memorable days we will have at Chuck E. Cheese. 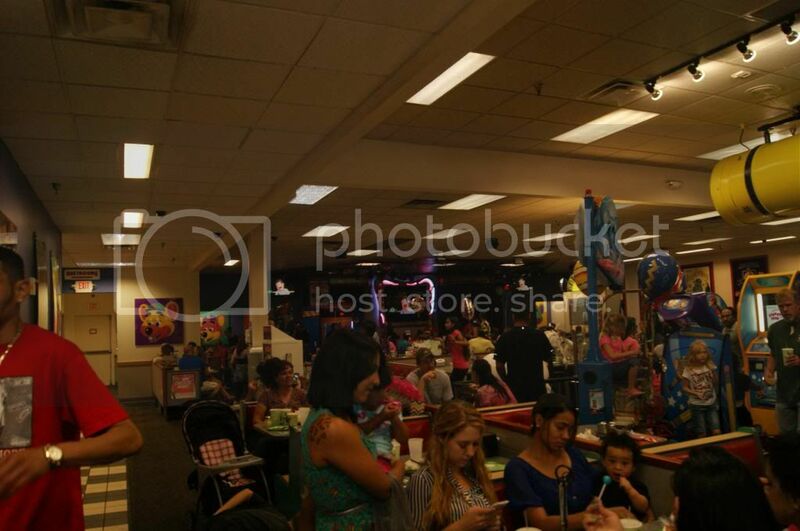 If you are planning a party, there is no better place for food and fun (for any age than Chuck E. Cheese. 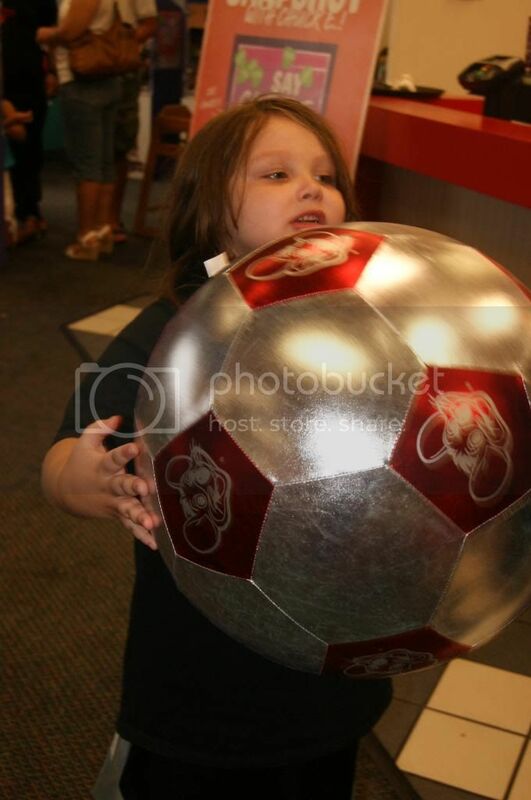 Weather it be a birthday, a graduation day, or a Tuesday, no reason is too big or too small to be celebrated at Chuck E. Cheese. Having a birthday is a great step great site in the right direction to a long and happy life. In fact you can never get there without a lot of them!